Is it possible for a compact crossover to feel like a sports car? That is what the 2018 Porsche Macan says it can do and we have to say the can passes the test with flying colors. The crossover has 3 engine options – a couple of twin-turbo V-6s and 252-hp turbocharged inline-four, providing 340 and 360 hp respectively, and that is is just for starters. The 252-hp turbocharged inline-four engine is on the base Macan while the twin-turbo V-6 is on the GS and the S. Put it simply these engines are powerful and consistent. The transmission is very responsive and the gearbox shifts gears quickly. Speed wise the Macan is comparable to 2-door Porsche models. The 2018 Macan comes with the same powertrain as the previous edition, with the aforementioned engines and dual clutch 7 speed automatic AWD. With a 340 hp engine, the S edition goes from 0 to 60 mph in 4.7 seconds. Granted you don’t need a crossover to go fast from 0 to 60 mph, but it only goes to show how good this Porsche is. When you mention the word Porsche the first thing that comes to mind is a super fast sports car. Well, the Macan is not a sports car, but the handling and acceleration are awfully close to that level. The brake pedal is also responsive. Compared to other crossovers the Macan does a better job when it comes to driver engagement. The decision to keep the chassis and the powertrain is a good one because they’re part of the reason why this is a lot of fun to drive. Going back to acceleration, the 4.7 that the S trim can do is slower than the GTS at 4.4 seconds. The twin turbo 4 base Macan provides excellent driving performance as does the GT and S with their V6 engines. At cruising speed the Macan is quiet and smooth. The transmission, pedals and buttons are all responsive. The dual-clutch automatic transmission 7 speed is built into every Macan model, and it is an excellent companion whether you’re in traffic or cruising. 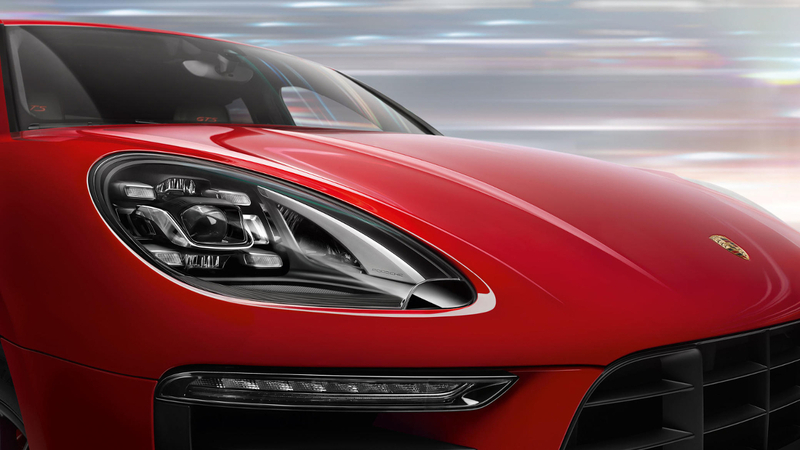 A sporty crossover has to be quick and the Porsche doesn’t disappoint. But the Macan is not just quick as it is also one of the most consistent crossovers on the road. The driving experience is well controlled and smooth, with no bumps or jolts even on rugged surfaces. The Macan has a solid grip in the corners and feels very stable. Compared to Porsche sports cars the handling is on the light side but it’s still accurate and highly responsive. Whether you decide to drive the Macan hard or soft it’s gong to respond well. Cornering is good and you always feel in control even when making hard turns. Braking needs 160 feet to make a full stop from 70 mph and that’s excellent for a crossover. The brakes are well complemented by its pedal. 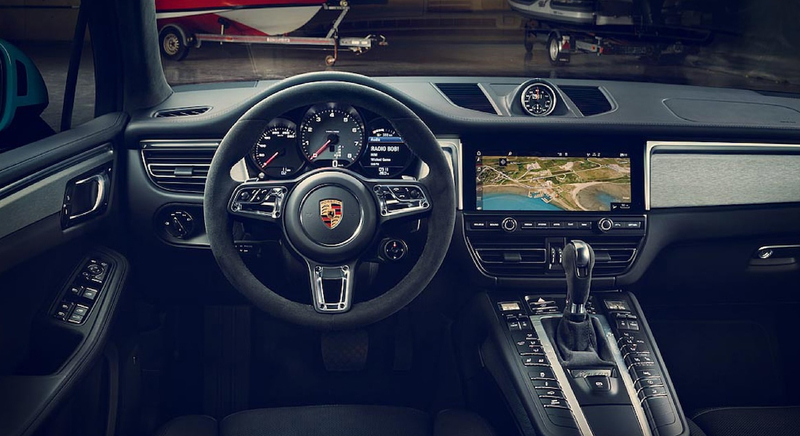 The 2018 Macan upgraded some of the interior features and now includes a display for air circulation. The air filter has been enhanced and there are new interior colors as well. As for the passenger back seat, it has less leg room compared to other cars in its range. That doesn’t mean you’ll be uncomfortable or have to squeeze to get in, but you’re going to feel the difference especially if you’re over 5’10”. The back seat is also quite small for child seas that face the rear. The seats are comfortable as they are, but there is a package available if you want the entire interior in leather. But even if you don’t spend for these the Macan is far more comfortable compared to a regular crossover. Standard features are a Bluetooth phone, Bluetooth audio, USB port and AUX input. Optionally you may add Apple CarPlay, Android Auto, 4GLTE Data, mobile Wi-Fi, voice control navigation, real time traffic and real time weather. The touchscreen is very responsive. The Porsche Communication Management (PCM) mechanism has also added a visualized volume control which is really nice, and the MyScreen feature is customizable. Some Macan models have Connect Plus which is designed to enhance cell signals in the car and has a convenient tray for your mobile device. There is also a good deal of 12 volt outlets and USB ports so you don’t have to worry about your mobile device running out of charge. For all its features, the interface is still easy to use and should appeal to most drivers. With its speed, elegance and excellent quality, the Macan takes the compact crossover to another level. Porsche made a lot of claims about this vehicle and as you might expect from the company, they delivered the goods and then some. Does the Audi Q8 live up to expectations?